Info "I'm thinking of an object. Which one?" Which One? 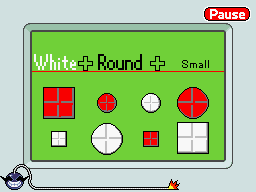 is one of Orbulon's microgames in WarioWare: D.I.Y. The object of the game is to use the clues at the top to determine which object is being described. The game starts off with an equation that looks like this: ?+?+? After some time has passed, the equation is fully revealed. The first part of the equation is a color, either red or white. The second part of the equation is a shape, either round or square. The last part of the equation is a size, big or small. The player needs to tap the object that matches the equation. For example, if the equation is like Red+Round+Small, the player needs to tap the small red circle. If the player taps the correct object before time runs out, the game is won. However, if the player taps the wrong object or time runs out, the game ends in a loss. This page was last edited on July 19, 2018, at 22:38.